To be sure, the media on the Right is often biased as well. The degree to which Sean Hannity carries water for Trump is often amusing to watch. But the mainstream media’s bias is something else, and it affects me personally. It leaves me feeling angry, betrayed, frustrated. As an immigrant from India who didn’t know much about the politics of this country 15 or 16 years ago, for years I trusted many mainstream outlets to give me an honest view of current events. It is now apparent to me that they haven’t presented an objective picture of current events, but a slanted, curated version that serves their purposes. Some examples: The Times’ left-leaning columnists wrote mostly anti-Trump columns for much of 2016, and acted like Hillary’s problems were happening in a galaxy faraway. Paul Krugman, especially, lost credibility in my eyes for literally becoming a Hillary shill in 2016, insisting repeatedly that her email troubles were overblown and a right-wing concoction. I couldn’t bear to watch Rachel Maddow in 2016 and still can’t. She’s a fine journalist who has wide knowledge and command of the facts, but her relentless, overdone partisanship was and is too much for me. Things got so bad that The New York Times issued a post-election letter to its subscribers, saying they looked forward to “rededicat[ing] ourselves to the fundamental mission of Times journalism.” But it was too late, at least for me. The damage was done, and I’ll never look at the paper the same way again. They didn’t actually have to overdo it. By virtue of his personality, President Trump gave them a lot of material, and they’d have been fine if they’d covered his flaws and missteps straight up. But they overplayed their hand, and not a little. Many mainstream journalists have become a little grandiose. They’ve joined the “Resistance,” and see themselves as grand defenders of democracy, as brave protectors of norms and institutions. The result is, you see a lot of preening, grandstanding, boundary-crossing journalism. What actually prompted me to write this article was something that seemed to me like the last straw. It was the Donna Brazile story—her recent explosive allegations that the 2016 Democratic Party primary was riddled with malpractice, that Hillary had secretly taken over the Democratic National Committee a year before becoming the Democratic nominee. You’d think this was a huge news story, but not if you were following CBS, NBC, ABC, or The New York Times. In the crucial initial days, these outlets devoted little or no time to it. They covered the story days after Politico broke the story, and Brazile appeared subsequently on “Morning Joe,” ABC’s “This Week,” and so on, but it was too late. The Times especially outdid itself. It buried the Brazile story deep within a story titled, “Hillary Clinton Gets an Award and Tears are Shed.” In the first couple days when the story broke, I got a better sense of the story when I watched “Tucker Carlson Tonight” and read Glenn Greenwald’s commentary. I didn’t go to a fancy journalism school, and don’t even have a journalism degree, but I know enough to realize that what is happening is bad, and that when the media self-divide into rabidly partisan camps, citizens suffer and democracy suffers. When Sean Hannity says “journalism has died in America,” I agree with him. WASHINGTON, D.C. -- Hillary Clinton's image has declined since June and is now the worst Gallup has measured for her to date. Her favorable rating has fallen five percentage points since June to a new low of 36%, while her unfavorable rating has hit a new high of 61%. Since losing to Trump, Clinton's favorable ratings have not improved, in contrast to what has happened for other recent losing presidential candidates. 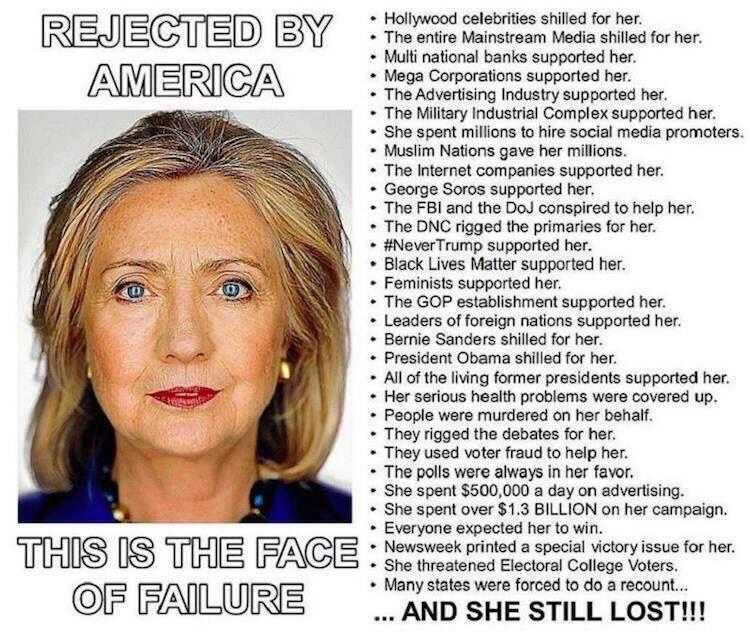 In fact, her image has gotten worse in recent months as Democratic leaders, political observers and Clinton herself have attempted to explain how she lost an election that she was expected to win. Meanwhile, controversy continues to swirl around Clinton given continuing questions about the fairness of the 2016 Democratic nomination process and her dealings with Russia while secretary of state. There has also been renewed discussion of Bill and Hillary Clinton's handling of past sexual harassment charges made against Bill Clinton in light of heightened public concern about workplace behavior.